The plan shows the position of the test pits site in Alswitha Terrace. 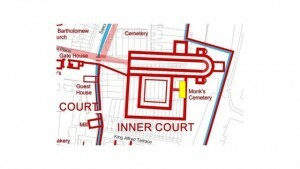 The most probable outline of the demolished church of Hyde Abbey is superimposed on the current street plan in red. In an exciting new development Hyde90 has worked with local archaeology organisation WARG to investigate what lies beneath a garden in King Alfred Place which covers a key corner of the demolished Hyde Abbey. 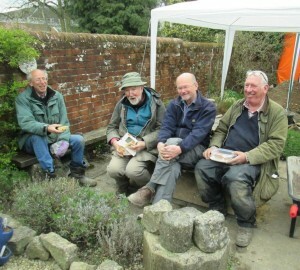 Volunteers were invited to take part and there was an open day to view the finds on Sunday 24th April. The hope was to find the south transept of the abbey church. The area had not been investigated since prisoners at the adjacent County Bridewell (Winchester’s prison) dug over the area to make a garden for the prison governor in the late 18 century. 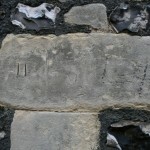 There were, however, many finds, dating back to the time of the abbey, that had been made in the Alswitha Terrace area. The photo shows floor tiles, stone and pottery fragments arising from building work which took place only 30 metres from the dig site. 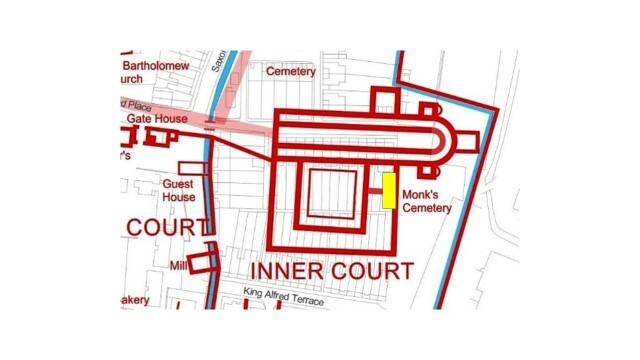 The plan above shows the position (in yellow) of the dig and the best estimate of the outline of the abbey complex as it existed in the 15 century. 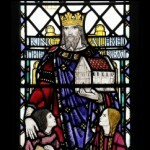 (Image data courtesy of Winchester City Council and the Hampshire Cultural Trust). The map below shows the total extent of the abbey grounds and associated building and some information on archaeological investigations that have been carried out previously. How did the volunteers join in? Arriving to collect equipment for the dig, I was amazed by the quantity of kit that Techer and Don deemed neccessary for digging two small test pits. They are only one metre square gentlemen! The kit was duly moved to Alswitha Terrace, and and areas mapped out for the spoil removed by the diggers, the position of the sievers and those doing the processing of the finds. A quick analysis of the feedback forms completed by volunteers confirmed the organosers’ feelings that the first day of of Hyde900’s inaugural community dig had gone well despite the cold, wind and rain. Sixteen volunteers took part in 22 two hour sessions throughout the day. Despite the waether all but one of the respondants wanted to repeat the excercise within the next 6 months. Clearly there is a ready market for any local residents wanting to offer their gardens in the future. In terms of finds, Techer Jones,WARG supervisor for the day, commented “Everything that we expected to come up came up” This included clay pipes,roofing slate, victorian pottery,nails and screws, a cow’s tooth and a considerable quanity of clinker. The star find of the day was a small attractively curved worked piece of flint, identified by Don Bryan as a neolithic scraper (used for removing hair from the skin of animals. 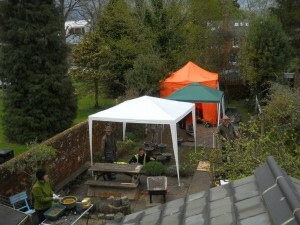 Whilst the diggers and finds processors worked in the (relative) comfort of the gazebos, the sievers had no such luck. 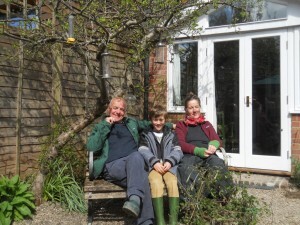 The conditions on the day meant that the copious supples of hot tea and coffee – not to mention the supply of biscuits, by our host and house owner, Martin, were partcularly appreciated. Additional biscuits, mede by one of the Hyde900’s team, Caroline Beasley, were also eaten with gusto – not just because the recipe was appropriately entitled Abbey biscuits. Nothing exciting was found in my time slot, but it was a great experience to slowly journey down through layers of soil, reading the different textures and colours. Dark crumbling soil, reminiscent of chocolate cake, was abruptly followed by a rocky layer of cinders. The cinders sat on pale soil studded with what looked to my untutored eye, like clay roof tiles. Small white labels were pinned to the square sides of the pit to mark the different contexts. Objects in the soil slowly revealed themselves and living roots forked down through the strata. There was a sense of journeying back in time. Other volunteers sieved the soil that I dug out, processing buckets of soil into neat conical heaps of different materials. Rain drummed on the protective gazebo above me and the scents of garden plants and crushed grass were in the air. Rain, tea, flapjacks and history made this seem a very English occasion. The day’s digging reached a depth og some 50cm. 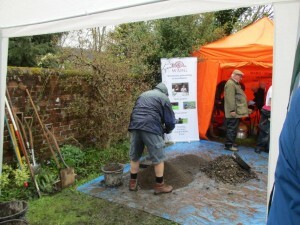 there is confidence that by mid afternoon on Saturday archaeology will be reached – we hope. Although Friday morning was damp and cold the diggers were eager to get going. The square to be dug is marked by the red pins in the upper picture. Below you see the first sections of turf being lift. As with the previous day, six volunteers appear every two hours to either dig, sieve or finds process as they had chosen on the on-line booking form.We were delighted to welcome local MP Steve Brine and assistant Russ to the dig. 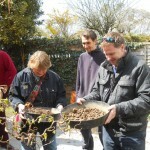 Steve, along with Hyde900 committee member Rose Burns, tried their hands at sieving, whilst the Project Advisor, David Ashby, from the University of Winchester looked (worriedly?) on.Progress continued to be made as successive waves of volunteers appeared on schedule, The friable top soil that had been the norm changed by midday into a layer comprising a mixture of clay and mortar. . WARG supervisors took stock of the layer and decided that a somewhat more robust approach was needed.The one mattock which had been bought along was supplemented by a second. As the the day came to a close the pits deepened, and some finds continued to appear. The tally by the end of the second day was a range of small finds – including a neolithic scraper, a Roman tile, and small fragments of glazed and decorated tiles . 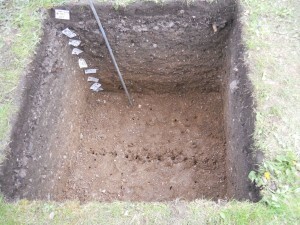 However, archaeoloogy was in short supply, and the day closed with the pits appraoching 1 metre deep. or accept (reluctantly) that we had chosen the wrong locations. 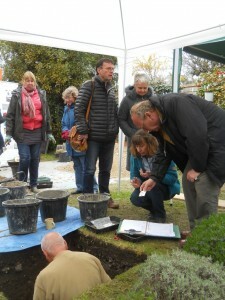 It was also an “Open Day” where anyone interested in the archaeology of the neighbourhood could visit the site, viewing the finds and seeinf the volunteers at work at the various tasks: these were divided into diggers, sievers, cleaners of finds and the labelling and recording of finds. the clay raft is reached. In addition anyone with any “finds” from Hyde or further afield could bring in their objects to the site, to take advantage of the expertise of the “A” team of experts Hyde900 had managed to coerce into supporting their dig. These included site suervisors from WARG, Chris Sellen, Techer Jones and Don Bryan,and from the University of Winchester, David Ashbuy and Mike Brace. By midday in the west trench signs of what were likely to be demolition rubble from the detruction of the church appeared as the material was a densly packed sloping layer of clay, mortar and flint dating was difficult. However there did seem to be indications in the cross section of the trench of similarly sloping layers of mixtures of mortar , soil, flint and topsoil in differing proportions, indicating demolition of an adjacent wall. The east trench was substantially barren, revealing only topsoil. The results were dissappointing, but the very marked difference between the two trenches was intriguing. The conference round the trenches was a sombre affair, particularly when Techer pronounced that we might even have found the base for the gprison governor’s garden toilet! 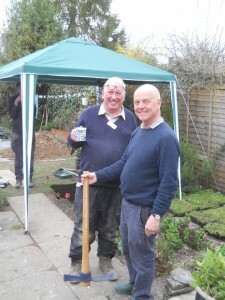 There was a huge plus – all the volunteers had enjoyed themselves immensly. 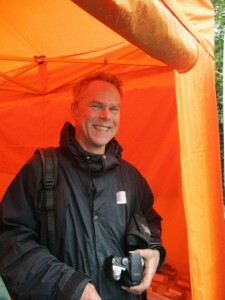 broad smiles all round despite the weather – wet, cold and windy. 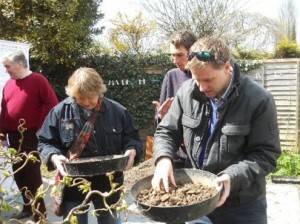 All were enthusistic to take part in another dig. Thus the major objective at this stage ahd been reached – particiaption of the residents and those from further afield, and their learning new skills and knowledge. Don Bryan digging surrounded by intersteted observers. The dig site was tidied up ready for photographing and recording the next day. As a final check on where the elusive wall might be, a probing exercise was carried out over likely portions of the site without significant results A final check was in the barren east trench . The barren trench apparently had more to offer. The probe hit a consistent level layer of a hard material at 20cm depth over a substantial part of the width of te trench in a north south direction. Don pronounced the results as warranting what he called a sondage – apparently the name for a trench within part of an existing trench. The mood of the site changed markedly as digging recommenced. Within minutes a firm layer of flint and mortar appeared within minutes. within an hour a half section of the trench had been excavated to a firm base which Don thought might well be the in situ remains of a robbed out wall. PCA – Pre-Construct Archaeology (PCA West). PCA provide a full range of archaeological and built heritage services and Paul, realising that we were likely to be pressed for resources, offered not only some of his archaeological staff, but also equipment. As time went on the results were so promising that Don declared that the rest of the trench should be excavated. The day finished on a high note. Such was the significance of what had been discovered that the digging of the remaining part of the trench had to be added on Monday. This called for some overtime on the organistion front. Not only were diggers needed, but sievers and finds processors. Two voluteers quickly responded to calls and would arrive tomorrow. The substantial list of volunteers who had expressed an interest in digging again (in fact that meant all of them) were emailed at 02.30 with a resume of the results of the momentous afternoon of the previous day, and a call for volunteers later that day. Unlike Time Team, the digging could be continued into day 4, with the aim being to excavate the remaining area of the east trench, and complete the recording and finds processing – but would we have the people to enable this? A quick call to Paul McCulluch to take up his offer resulted in one of the PCA archaeologists, Dominic Mcatominey, arriving by 9.30 and an offer of an additional one later that morning. By 10am there was a full digging , sieving and finds processing team at the site. Dominic disappeared down the trench whilst Techer,the WARG site supervisor for the day, got on with drawing what had been found in the west trench. Techer celebrated by calling a 10 minute lunch break. And allowing Paul McCulloch’s team – now increased to two with addition of Ryan Wolfe, to have a 15 minute lunch halt. 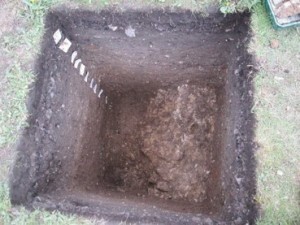 By 2pm all spoil had been sieved, and it was forecast that finds processing could be completed by the end of the day. Techer called a site conference to discuss the results – particularly finding a north-south wall when the southern (ie east-west) wall was the target. After much discussion which included many points of view, the consensus was that it was in all probaility the eastern wall of the south transept had been found. This was largely based on the proximity of the trench to the previously assumed position of the eastern wall. No doubt the matter will be much debated in future months (years? ), but the thought that the dig might have moved the assumed position of the abbey church 1.5 metres to the west was an exciting conclusion to an amazing 4 days. Hyde900, WARG and all the volunteers are imensly indebted to Chrissie and Martin for allowing them to have had such a great experience. Hopefully the project will stimulate other householders in the Hyde area to offer their gardens for a future dig! 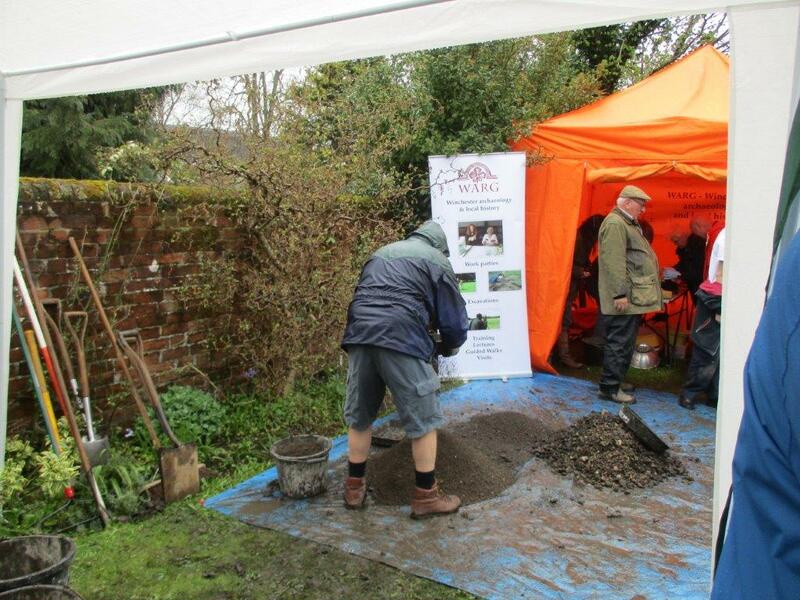 A quick analysis of the feedback forms completed by volunteers confirmed the organosers’ feelings that Hyde900’s inaugural community dig had gone well despite the cold, wind and rain. 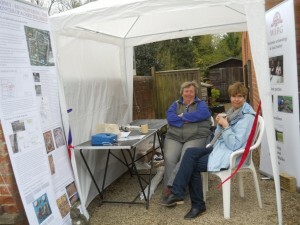 32 volunteers took part in 51 two hour sessions throughout the event. Despite the weather over 75% of the 18 respondants to a questionnaire wanted to repeat the excercise within the next 6 months.